If I remember this female is about 5cm across her leg span. She is a fully mature female in the middle of the mating rituals. Her web is across the sealed back window of the old fibro garage. 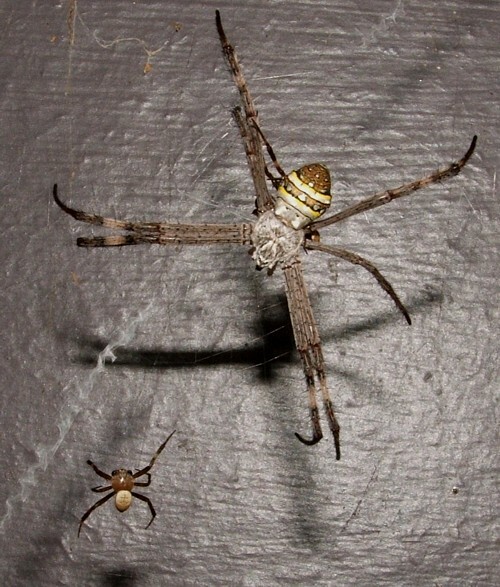 The six-legged spider is her mate. He climbs back to join her after she has eaten another suitor. 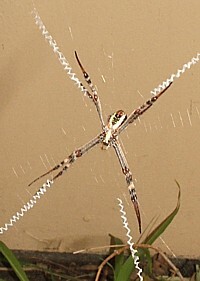 These females rarely move once they have found a space and made a web. 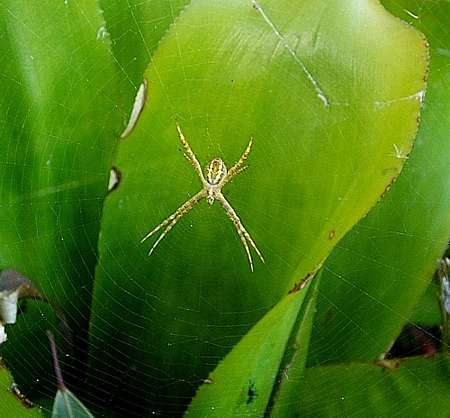 At Budgewoi they inhabited the space above the Bromeliad garden in great numbers and one year they were so tightly packed I could not slip my hand between many of the webs and their neighbours. If there is an undisturbed space such as these Bromeliads they will move in and to keep them happy just leave them alone apart from a little mist of water from a spray bottle if it gets too hot. Regular watering will not chase them away if it is gentle. For me this is what I consider going the extra yard to have a special garden rather than just a sterile collection of plants and dirt.